HPE RECOGNIZED WITH 2017 SMACNA SAFETY AWARD! 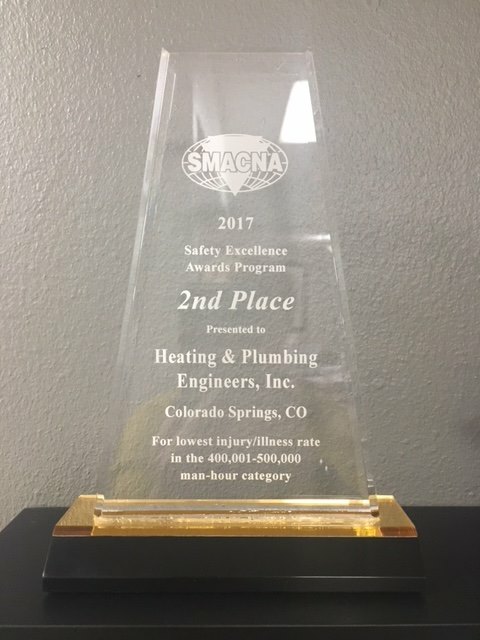 Each year, the Sheet Metal and Air Conditioning Contractors’ National Association (SMACNA) congratulates its members for their outstanding performance in occupational safety and health through SMACNA’s Safety Excellence Award Program (SSEAP) -- and we are excited to announce that Team HPE was honored with a SSEAP 2nd Place Award, in 2017! Safety and health continues to be a high priority for SMACNA contractors; SMACNA was proud to acknowledge the 2017 SSEAP first, second, and third place winners -- which were determined by man-hour categories and Occupational Safety and Health Association (OSHA) incidence rates -- as well as honorable mentions, late last year. At HPE, safety isn't just a 'checkbox' -- it's a commitment and a passion engrained in our performance-based culture! Congratulations to our entire team for this well-deserved honor!